Imaginations of a Day | Thoughts on life, God, and everything. My BFF Vicki got married on April 2. I hadn’t been a bridesmaid for some years, and there I was, a matron of honor for the first time (I strongly disapprove of the term “matron”, by the way. Sounds so old, so fuddy-duddy. I’m officially petitioning for the title to be changed to “Woman of Honor.” But I digress). It truly was an honor to be a part of my best girl’s special day. Wise men and women say two things: 1) The day will not be perfect. Something WILL go wrong. 2) That’s okay. It will be beautiful anyway. Just enjoy the moments! Harrowing: I picked Vicki up around 7:45 am and took her to Macy’s to get her makeup done at 8 am. After waiting for 45 minutes we came up with a plan B for makeup and headed out the door. We were in the car and about to drive away when the lady walked up. Apparently there was a marathon going on around the mall and she couldn’t get through! The makeup turned out beautifully and lasted all day. Hallelujah! Humorous: Once we arrived at the church, the bride’s room (which was a nursery- show of hands, how many of you ladies have been set up in a nursery for a wedding?) became a scene of feverish activity. There were several bridesmaid dress mishaps. First and worst, I had gone on vacation the week before and had eaten a lot of rolls and ice cream; therefore, I didn’t really fit into my dress. I put my hands on my hips, sucked in with all the strength I had, and the dress just zipped up- thank you, Wallisha, for taking on that task. It was terribly uncomfortable. It wasn’t until later that I realized it had gouged holes in my back. Literally, I had scabs. Then Shuree got something on her dress, so we doused her with water and used the steamer to dry it. Then suddenly I had a huge stain across the front of my dress- I still don’t know how it happened- and they did the same for me but it didn’t work. Oh well, nobody noticed! Hallelujah! Hallelujah! : Vicki was the eye of the storm. She simply put on her dress and sat in a child-sized chair as we all whirled around her. In addition to us bridesmaids running around doing hair and makeup and burning ourselves with the steamer, there were children under foot, hostesses trying to find ties and guest books, and family members constantly taking selfies. Despite the chaos, we were able to find time to pray for the bride. Gathering around her to speak a blessing over her wedding was a beautiful moment. Harrowing: The wedding was supposed to start at noon. Again, I see Vicki in my mind’s eye, sitting calmly and saying something to the effect of, “I’m ready to get married. What’s the hold up?” We finally headed to the sanctuary around 12:30. I think that starting late was really a blessing because when it did start just about everyone was there- A couple hundred people gathered together for this awesome occasion. Hallelujah! Humorous: I’ll just say one word: aunties. Aunties were in full effect at this wedding. Towards the beginning of the ceremony there was an aunty in a large hat taking pictures front and center, but Thank God she sat down. I thought I was going to have to send a bridesmaid to confront her, or do it myself (okay, not really). After the ceremony, there was a group of aunties up on the sanctuary platform taking pics. They kept backing into the shots the professional photographer was trying to take of the bride and groom down front. He sort of just looked at them until someone shouted them down. We got some good belly laughs on that one! Hallelujah! : The ceremony was beautiful. It was amazing to watch Vicki walk down the aisle, and just as she came to the end the music swelled and the song hit its dramatic high point and it couldn’t have been any better if it had been a movie. The whole thing was a perfect mix of music, heart, humor, and the Word of God, all capped off by a lovely kiss. Sigh! Humorous: Their first dance was so cute. James did this move when he would spin Vicki where he would put his arm out like a ballroom dancer. Hilariously precious. I wish I had a video of it. Watch this bald guy when he puts his arm out- it was kinda like that except not quite as graceful. James, all you need is a little training! Hallelujah! : Food: delicious. Cake: delicious. ‘Nuff said. Harrowing: It turned out to be very difficult to get a piece of cake, though. There were so many people, and it was served later in the reception, so people were moving around a lot. I stalked servers. I went to the door of the kitchen. A group of us gathered around the cake table like sharks as they were putting the last layers away. Please don’t put it away! I want more cake! All of these moments made for a wonderful day that went by too fast for me. As we were talking about it a week or two afterwards, Vicki noted that people had been telling her how her wedding had blessed them. It’s easy to get caught up in what doesn’t go as planned, but here’s the bottom line: friends, family, and loved ones gathered to see this woman marry a wonderful man. Her family and cultural traditions were honored, and most importantly, God was honored. Life has been wonderfully crazy in the last few weeks. So I am a little late in writing about these events but I still want to memorialize them. First up- 5th anniversary vacation to the Biltmore Estate! Do you have certain things you do before you head out of town? We have the car ritual (for road trips) and the packing ritual. My husband and I have a thing about cleaning the car and making sure we have a plastic bag to hold garbage. There is a detailed snack negotiation that happens (“We should bring fruit!” “We need Oreos!”). Finally, we meticulously go through our CDs so we each have what we want for our own portion of the driving. The packing ritual consists of me trying on all possible outfits to make sure I like the way I look in them. Sometimes, when I put on clothes, I look in the mirror and think I look dumpy. Sometimes, I then cry for 30 minutes, mourning the loss of the body I had that might never, ever come again… so, since I do NOT want to put a huge damper on the trip, I do all that in advance. Departure time was set for 9 am Monday morning to account for the loss of an hour to the Eastern Time Zone and stops for food, gas, and the bathroom, allowing us to still arrive a little before check in. I like to have every possible moment in that hotel room, you know what I mean? Unfortunately, somehow, we ended up leaving at 11 am. Let’s see- making breakfast, cleaning the apartment, loading the car, and stopping for cash somehow ate up two hours. I don’t really know how that happened. Then we got it into our heads that we had to have Chick-Fil-A for lunch. Hubby’s phone said there was one 3 miles away or something like that. The problem was that we were smack dab in the middle of Knoxville, Tennessee. We pressed on, though, and found ourselves winding through one way streets and numerous stop lights. 45 minutes later we were heading back to the highway with the beloved sandwiches in hand… making it almost worth arriving about 3 hours later than planned. I don’t know about you, but I get a bit anxious driving to an unknown place. As we approached our destination, I sat up real straight in my seat, eyes darting back and forth from GPS to road, and I started to worry about getting lost and finding parking. I always get real uptight about parking! Someday I need to psychoanalyze that. Anyway, we made it without mishap to the Inn at Biltmore Estate. Sigh. Relax and release. The mountains were indeed there as the website had promised. Our room was pretty too- I jumped up and down and giggled, opened everything, touched everything. Hubby checked to see what channels we had and I analyzed the items in the bathroom (What? Why is there a scale here? Why would a hotel in a vacation spot put a scale in the bathroom? I couldn’t NOT step on it though). Then I unpacked every single thing we brought. The Biltmore House- the largest house in America! And this is the side view. I get the whole safety thing but these dorky helmets really ruined my photo ops! Oh well. Now hubby wants to buy one of these, which costs roughly the amount of a small house. Fancy dessert at the end of our fancy anniversary dinner! This trip was a precious time for us to reflect on how far God has brought us in the five years we have been married. I love how our intimacy and oneness has grown, and there is still so much to learn. We made a list of the year’s top moments and the miracles God has performed in our lives individually and as a couple so far. I am truly blessed and grateful. Happy Anniversary to us! I’d like to share a poem with you: “The Second Coming” by William Butler Yeats, written in 1919. From the first time I read this poem it has been one of my favorites. It captures the tenor of our times quite well, doesn’t it? My favorite line is “The falcon cannot hear the falconer.” We spiral out, getting further and further away from the voice we ought to be listening to. Then hate and fear grow until it feels as if things are falling apart. Innocence is lost and we struggle to stand up for what is right. The worst parts of ourselves are loud, passionate, and intense, while the better parts hide quietly. I sense change and justice in those words. We stand in hope and faith that they will come. The lion with the head of a man is not a comforting figure, but he has the strength and power to make things right, which is something I think many of us long for. Writing about this poem makes me think about how we all have those pieces of art that touch our souls and say what we can’t quite express. Do you have a song, novel, poem, essay, or painting that really speaks to you? I’d love to hear about it in the comments. More to come soon- in the next 30 days I’m celebrating my 5th anniversary AND my best friend is getting married! Whoopee! Happy New Year! I haven’t posted in about two months, and I knew I could not let the first month of the year pass without posting something. I’ve been going through a period of writer’s block and feeling like I just don’t have anything to offer, anything to say, anything to add- to anything. There comes a time when you wonder whether whatever it is you’ve chosen to go after, whatever that thing is that you love- you wonder if it’s really the right thing for you to do. You wonder if you have what it takes. I know this is normal, but it stinks. Someone once told me, or maybe I heard it in a sermon, that we must move from desire (I want to be a writer! I’m going to be a lawyer! I’m called to paint!) to discipline (work at it regularly, do it when you don’t feel like it) before we can truly delight in what God has given us to do. I feel pretty stuck in the discipline stage, so here I am, encouraging myself and you, my wonderful readers, to just do it, even if it doesn’t turn out exactly how we want it to at first. I promised myself in November that I would work on my writing every day, even if only for 10 or 15 minutes, but whenever I would think about doing it, I would get this overwhelming feeling of… well… being overwhelmed. It was like looking up at a tall mountain and getting depressed by the scope of it. All those negative emotions welling up. Yesterday I read this in 2nd Timothy: “For God has not given us a spirit of fear and timidity, but of power, love, and self-discipline” (1:7 New Living Translation). One of my absolute favorite verses in the Bible. God gives us the spirit of power- boldness to step out and do what He has called us to do, no matter how hard it seems or how inadequate we feel. And love is the foundation and the goal and the point of everything: loving God, others, and ourselves. And then self-discipline, the ability to train ourselves to be our best. I’d love to hear about what dreams and goals you are pursuing in this new year! Send me a comment. The positive side of this is that when I do the wrong thing I can take responsibility and learn from my mistakes. It’s very important to try and do the right thing in every situation. Feeling a little old fashioned guilt and shame isn’t always a bad thing, because they can lead a person to change her ways. (Check this link for more on the difference between conviction and condemnation). But… a mind dominated by the cycle of 1) try to be perfect, 2) make a mistake and 3) feel horrible guilt and shame is an unhappy one, and I have been stuck in it many times before. It’s a delicate balance I’m still trying to master. Here’s the new cycle I want to develop: 1) make a mistake, 2) ask forgiveness, 3) remember that God loves me and 4) move on. God doesn’t expect me to be perfect. Funny how I can know that with my mind but not feel that in my heart. Yes, He wants holiness, but holiness is more about the heart than doing everything right all the time. God knows everything about us already and still loves us. As we get to know His character more, we learn to love Him more and more; our desires change and we become more like Him. That makes a heart holy. So when I do something wrong it’s good to ask those questions. But what about when things just go wrong- from a flat tire to sickness to dreams deferred or denied? When these things happen my default is to obsessively ask those two questions when the answer to both of them might be “nothing.” Or maybe there is no answer- for now. The constant questioning in these moments of uncertainty places too much emphasis on me- What did I do wrong? What should I do differently? If I can get answers then I feel that I can control the situation. Of course, in reality I can’t know or understand or control everything. This is the time to focus my thoughts on the character of the One who is worthy of my trust (Proverbs 3:5-7, Psalm 33:4). God lavishes extravagant love on us. He calls us to love Him, delight in Him, rest in Him, and hide in Him in times of trouble. I trust Him to forgive me when I do wrong; it seems so much harder to have faith in Him when things aren’t going the way I want them to. That is the very faith that pleases Him, though (Hebrews 11:6). There is a time for questions, but when you hear nothing, take some time to be still. The Lord will show you what to do, even if it is simply to rest (Psalm 46:10). Today is my mom’s ___th birthday (hint: the number is between 59 and 61)! I’m not shy about telling her age because she is gorgeous and doesn’t have a SINGLE wrinkle on her face. Not one. Please, God, let me have inherited all of her skin genes! I’d like to take this opportunity to publicly thank her for being such an amazing mother. – Thank you, mom, for teaching me to sing everything from worship songs to show tunes to “Elvira” (Oak Ridge Boys) to “Gloom, Despair, and Agony on Me” from Hee Haw. Harmonizing with you is one of the great joys of my life. – Thank you for being such a world-class baker. Your cakes and cookies are the stuff of dreams.Right now I’m fantasizing about chocolate chip cookies and a yellow cake with chocolate icing. – Thank you for supporting my theater career. Remember my first show, Once Upon a Mattress, when I was 11? You found my costume at Goodwill and dyed it purple for me. You ferried me to and from rehearsals all through high school. Remember when you called the director because I didn’t get the lead part? So embarrassing then, so sweet in hindsight! And you saw every performance of Godspell while you were here last spring. – Thank you for getting me all set up for my adult life, first in college, then in graduate school, and then when we bought our first home. You’ve helped me buy everything from a car, to a computer, to a TV, to bake ware. – Thank you for making holidays and birthdays so special, from decorations to food to gifts.You kept buying those Lego building sets I asked for… until the day you broke my heart and said I was too old for them. I’ve let it go. – Thank you for taking me shopping and buying me clothes. I admit, when I was younger the shopping trips were often tedious to me. I still don’t quite have your stamina, but I do enjoy it. – Thank you for not cussing (cursing?). I never once heard you say a bad word. You assure me that you may have, at one point in your life, said those words, but I never heard them. – Thank you for serving God and taking me to church. I know Him so much better because of you. – Thank you for your honesty and encouragement. You tell me you’re proud of me, and you tell me that I shouldn’t be so hard on myself. You also tell me to stop being so dramatic. – Thank you for being an example of strength. Through many obstacles you have persevered and maintained your faith. When I was young I thought I was nothing like her; in the past few years I’ve come to realize that we are practically the same person. When we sing together you can’t tell whose voice is whose. On the phone we sound identical. We are both introverts, both sugar-obsessed (but recovering! ), and we both tend to get anxious when things don’t go as we planned. As I get older my mannerisms, facial expressions, and reactions continue to become more and more like hers. And I’m celebrating that now more than ever. I come from a woman whose experiences have uniquely shaped her and thus me as well. Musing on these things is an endless source of laughter, delight, and insight into God’s design and God’s grace which covers us all. So here’s to you, mom! I love you and happy birthday. A couple of weeks ago I went away to summer camp for the first time ever in 38 years. Now don’t get me wrong, I was outside a lot in the summers- I didn’t only sit inside and eat cookies and read Tolkien books. But I had never gone away to a sleepover camp. A friend of mine heard about Lighthouse Christian Camp through a presentation at her church. This organization provides the camp experience to about 60 children a week who otherwise would not be able to afford it. They have counselors on staff, but they also like to have volunteers come so the kids can have more positive adult interactions. My friend wanted to do it and asked me to go with her. I said yes! That was a month or so before our camp week was scheduled, and I’d been thinking a lot about sharing my faith with others. I was looking forward to camp being a time to invest in the lives of the girls attending. Finally, the day arrived. My counselor and I were assigned ten girls ages nine to eleven, and from that Monday morning until Friday afternoon we had a full schedule. We went horseback riding, hiking, swimming, and boating on the lake. There were skits, a hay ride, two campfires, and in between it all three meals a day (plus a snack!) featuring everything from biscuits and gravy, to meatloaf, to banana pudding. I probably don’t need to tell all you camp connoisseurs that there was constant singing of silly camp songs. I kept getting surprised when someone would start a song for the 20th time that day and everyone would join in- again- with equal vigor. I’m just now getting those tunes out of my head. The girls also attended daily chapel services during which they sang worship songs and listened to a message. In the afternoons they had time to discuss what they had heard and learn Bible verses as well. Through it all my job was to ask questions, listen, and of course make sure no one tumbled off the boat, horse, or trail. I felt a sense of urgency to connect with my girls, knowing that the time was short and moving fast. I had to pay attention and grasp those opportunities, like when one of my girls forgot her towel during swim time. She didn’t really need to have it right then, but I offered to walk her back to the cabin to get it. We were always walking, waiting, or standing in line; those were the moments I could ask, “What’s your favorite movie? Do you like school? Who is a part of your family?” and in that way get to know each girl better and also tell them about myself. Towards the end of the week we had times of prayer after chapel where the girls could go out to their counselors and share what was on their hearts. This was the part I was most nervous about. Would I say the wrong thing or be awkward? We were not to ask them if they wanted to follow Christ- they had to come to that decision completely on their own. Our role was to simply ask, “What brings you out here tonight?” and then listen. Of course a few of them really had no clue and just came out because others did, but one girl wanted to ask for forgiveness for being mean to her brothers. Okay, I told myself. Just listen. She prayed a beautiful prayer and I followed with my own afterwards. Another girl was moved to tears over a death in the family. Oh dear, I thought. What are the right words to say in this situation? Lord, help me to be sensitive and give me wisdom! I hesitantly asked her if she felt like God was speaking to her heart and she said yes. “What do you feel He is saying to you?” She just shrugged. I don’t remember exactly what I said, but I tried to comfort her as best I could. I felt woefully inadequate as I told her that it was okay to feel sad and that she could always pray and ask God to comfort her and give her peace. Then, as with the other camper, I let her pray and then said a prayer after. At the Thursday night campfire, after we had finished the s’mores, we turned off all the flashlights except one and allowed each camper, staffer, and volunteer to say what camp had meant to them. The girls spoke, some quite eloquently, of how they had made friends and learned about God. When it was my turn I said that if they would keep reading the Bible and keep praying, they would continue to learn about the God to whom they had been introduced. I believe that with my whole heart. I left camp with a sunburn, a lot of bug bites, and the realization that sharing my faith can take different forms. Sometimes I will have the opportunity to present the gospel and lead someone through a prayer, but sometimes it’s just about listening, asking questions, and being aware of where God is already at work. My words may not be brilliant or profound, but they should be from the heart. I believe God was moving in the hearts of those girls; it was evident when they worshiped, when they worked so diligently on learning Bible verses, and when they prayed. I’m so happy that I got to be a part of their individual journeys. “So then neither he who plants is anything, nor he who waters, but God who gives the increase” (I Corinthians 3:7). Recently I’ve been unable to button most of my pants. I’ve literally been going to work and church with my pants unbuttoned. I just throw a long, flowing top over it and it totally works. I’ve refused to buy pants that do fit because I’m determined to lose the weight. This weight gain has been accompanied by fatigue and feelings of sadness and discouragement. Granted, I haven’t been exercising as much as I should, but I’ve been doing some at least. And I did think I was eating pretty well. I’ve been health conscious for many years now. I’ve read books, listened to tapes, and scoured the Internet. Yes, some of the information is contradictory, but there is still a lot of useful knowledge out there. The transformation in my eating started about 13 or 14 year ago when I cut out processed foods- anything in cans, boxes, or bags. I was eating a lot of Steak-Ums, Hamburger Helper, Stouffer’s French Bread Pizza, and Pop-Tarts at the time. I slowly transitioned into eating more fresh, whole, natural, and organic foods, and I also traded the pop and juice for filtered water, at least for the most part. These changes made me feel a million times better and I’ve stuck to them. So why was I gaining weight? What had happened (other than marriage and getting older, which have always made people fatter)? Well, I threw myself back into research. Should I go meat-free or Paleo or gluten-free again? Over the years I’d tried them all: you take away something you want desperately to eat and in exchange you lose weight and hopefully feel better, although there are many, many moments when you feel very sad and very hungry. Should I try certain programs or supplements? The more webpages I clicked the more stressed and overwhelmed I felt. Finally I grew tired of trying to figure it all out on my own and I just prayed for God to help me understand what was going on. A few things have happened recently that have given me some understanding, and I sensed that God was indeed at work. First, I had made an appointment with my internist months ago and totally forgot about it. Just as I was getting concerned about my weight gain I went in for my physical and stepped on that dreaded scale. I was absolutely flabbergasted to discover that in the two years since my last checkup I had gained TWENTY POUNDS. Impossible, I thought. But the number was right there, and the unbuttoned pants bore witness. After that fateful moment at the doctor’s office, I decided to finally start a food diary. For months I’d had a persistent idea to do it but I brushed it off, telling myself I was doing fine. A week of doing the online diary showed me that most days my calories and/or saturated fat and/or sugar totals were way over the recommended levels. Organic butter and uncured pork are still butter and pork, and all-natural ice cream is, after all, still ice cream. And maybe I had been taking more trips to McDonald’s and Coldstone Creamery than I thought. Ignorance had been bliss, but ignorance was over. Dang it! Then I got my lab results which showed that my thyroid levels were off. Thyroid function can really affect weight, so that was another important piece of the puzzle. Finally, my husband and I got appointments with a holistic doctor who is usually booked months in advance. My mother-in-law had been trying to get us in, and they actually had a cancellation two weeks after my physical and one week after I got my tests back. This doctor explained in a clear and fresh way how the entire endocrine system works, how food powers the body, and how our thoughts, words, and emotions can positively or negatively affect our bodies. This was the most powerful thing I learned. Stress and negativity will hurt my well-being; positive thoughts and words will boost my health. Proverbs 18:21 says that the tongue can bring death or life, so in addition to adjusting my eating, exercising more, and supplementing my endocrine system, I am focusing more on thinking and saying words that are full of hope and life. This experience has also brought 1st Corinthians 12:7-11 to mind; Paul talks about spiritual gifts, three of which are wisdom, knowledge, and discernment. I believe God gave me these gifts through the timely events of these past few weeks. I now have new hope about my weight and my health. I’m still on the journey but it feels like I’m moving into a new phase. This process is intensely personal. What works for me may not work for you. Besides food and exercise, there are many other factors to consider as well- genetics, hormone levels, food sensitivities, the list goes on. I wrote this post to encourage you to find out all you can about your own body, and to keep learning and trying. We must listen to our bodies and to God’s Word- they will tell us how to stay on the path to health. It is worth it. I was in Oregon a few weeks ago for my Spring Break, spending time with my family and enjoying the spectacular natural beauty of the state whose name, by the way, rhymes with dragon (not lawn). 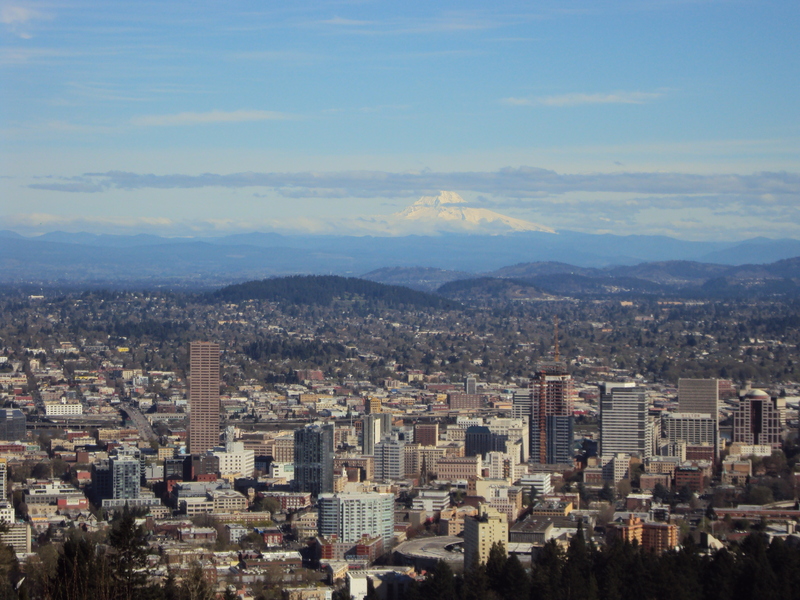 This view takes in downtown Portland, the green hills, and snow-capped Mt. Hood presiding over it all. I saw this mountain just about every day during my childhood. What a blessing! It rises in crisp detail, always feeling close enough to reach out and grasp. I’m definitely a beach girl, but I miss seeing the mountains. While the ocean gives me a glimpse of God’s vastness, the mountains speak to me of His majesty and His proximity. Here’s another view of the hills around Mt. Hood. Do you see the pine trees? Tennessee has plenty of rolling green hills- for about six months out of the year. Oregon has hills that are ever green with ancient, towering trees covered in moss; steady and unchanging like the nature of God. When I look up into their branches I think about time stretching up and out and on and on. Oh, and I love the smell of pine. That smell combined with the clear, clean air just makes me breathe more deeply and slowly than I do in other places. Each breath is an invitation to relax and receive peace. 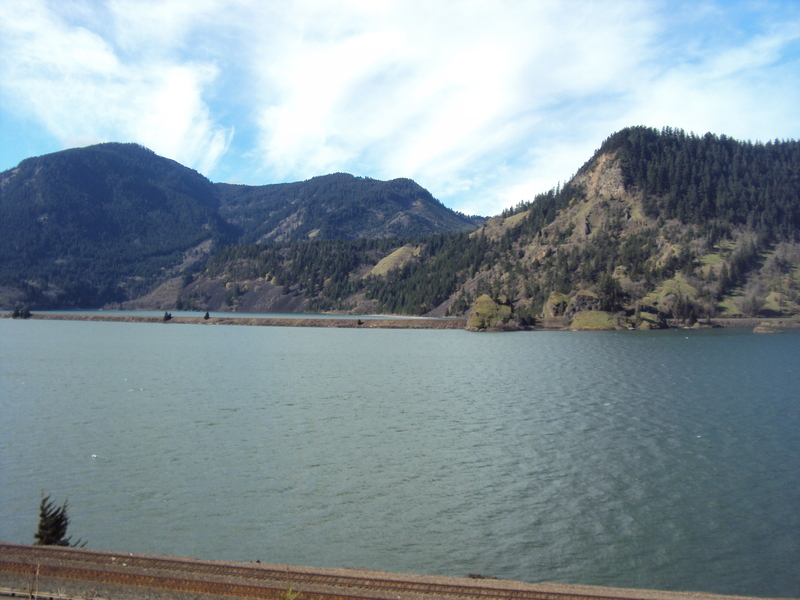 This is the Columbia River gorge, and the picture doesn’t really do it justice. There are places where you can look in either direction and see for miles- the turns in the river, the cliffs, the folds of the hills. I loved to cross this wide river as a child. I would look west and feel that if I could just get past that next bend, I would see it meet the sea. Rivers are all about possibility and adventure, right? Check out this Emeli Sande song for a profound message from the River Himself. Of everything I saw on my trip, the waterfalls gave me the most joy. As you drive up the gorge there are many, from the famous Multnomah Falls (611 feet!) 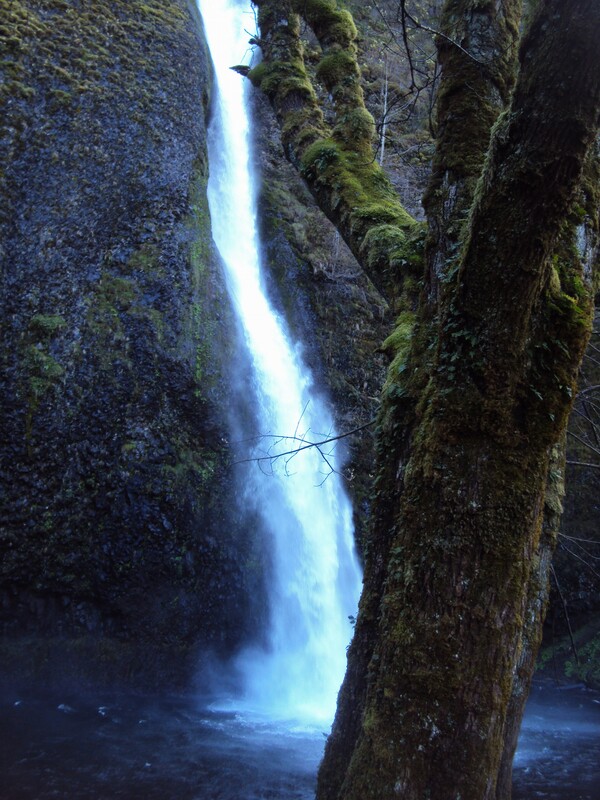 to the one in the photo above, Horsetail Falls, to slender little streams. Here’s the thing about waterfalls: they never stop flowing. The water never runs out. With thundering abandon they continually pour out, a picture of what extravagant, abundant love looks like. I didn’t even get to talk about the moody, gray Oregon beaches or the fact that the eastern half of the state is desert… I’m just gonna end this by telling all you nature lovers to start planning your trip to Oregon! It’s perfect for those who want to be active (hiking, biking, skiing, windsurfing, etc.) and those like me who want to observe, ponder and be inspired. 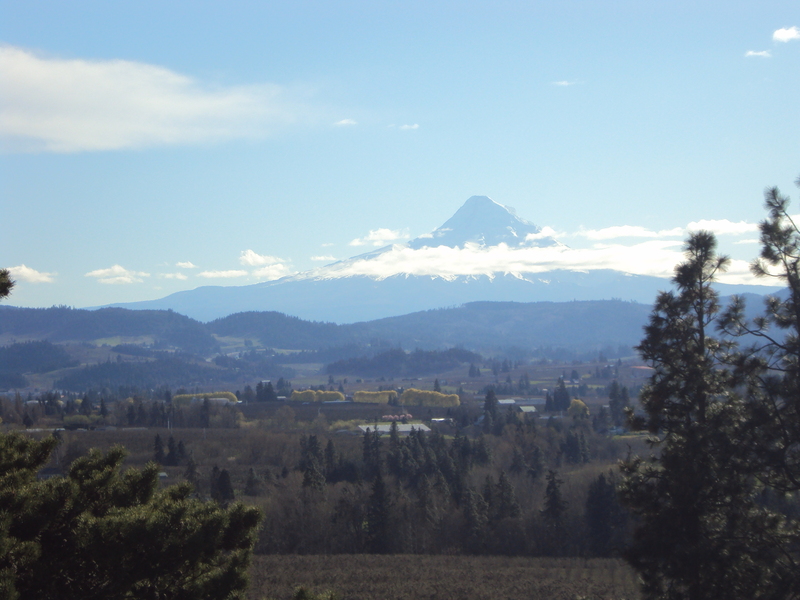 Yes, I’ve waxed (maybe a tad bit too) poetic in this post, but gosh darnit, Oregon does that to me. It’s what I like to call God’s Own Country. 5:30 am (or p.m. the night before): Receive automated call from employer. Do a funny dance and sing a little song that goes something like this: “I don’t have school! Oh yeah, who doesn’t have school? Me! Why? Because I’m off, I’m off, I’m off…” Gloating in the presence of your significant other is how the celebration begins. 7:00 am: Consider making an awesome breakfast of French toast or pancakes, bacon, etc. to continue the celebration because you have SO MUCH TIME…. then dismiss the idea because you are feeling lazy. Instant oatmeal it is. 8:00 am: Peek out the window and watch the one you love struggle to get snow and ice off the car. Feel a twinge of sympathy, just a twinge, as you let the curtain fall back into place. 8:30 am: Grab a book and settle in for one of life’s best gifts: the late morning sleep. 11:00 am: Contemplate engaging in various productive activities such as shredding old documents, cleaning out the junk drawer, going through the closet for donation items, making appointments, and starting the next great American novel. 11:07 am: Give up and instead surf the Internet for entertainment news. 12:30 pm: Have lunch. You really want to go out for a Quarter Pounder with Cheese, but you don’t want to scrape ice off your car and wait for it to warm up, so you have a bowl of cereal and put a handful of chips and an apple on a paper plate. 1:00 pm: Browse Netflix for a TV show to binge watch. 1:45 pm: Halfway through the 3rd episode you start to feel guilty. You go put on your exercise clothes, knowing that it will motivate you to do your workout- right after you finish that episode. 2:00 pm: Nap on the couch in your exercise clothes. 3:00 pm: Bored and feeling like a caged tiger. Certain you need retail therapy, you throw on clothes, get the car cleaned off, and head to Ross. 4:30 pm: Back home and suffering buyer’s remorse. Your purchases stay in the bag and will probably be returned tomorrow. 5:30 pm: Existential crisis hits. You are listless, wondering what happened to your day and thinking about what you should have done: read the Bible. Pray. Call your mother. Exercise. Make a gourmet meal. Start the next great American novel. 6:00 pm: Impatiently waiting for spouse to return home so you can have some sort of meaningful interaction with another human being. 8:00 pm: Another peek out the window. The roads aren’t clear yet, so you are waiting for another call. And then you wonder whether you really want to get that news after all. Literaree is currently getting through her 8th snow day this winter. After she publishes this post she is going to start working on that novel. She promises.